As a child of the 1950s and 1960s growing up in the American rural Midwest, I was accustomed to seeing various advertisements painted on the sides and roofs of barns. In recent years, however, those iconic sights are becoming more and more rare. During my childhood, you couldn’t travel ten miles in any direction of my home without seeing a handful of “billboard” barns. 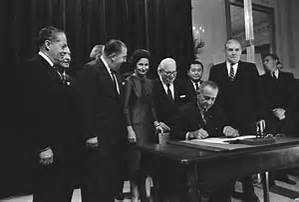 The most common of those were the ones promoting Mail Pouch Tobacco. 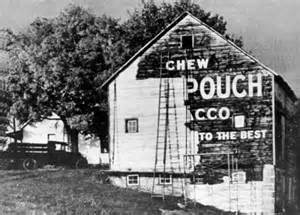 While I don’t in any way advocate the use of tobacco products, I must admit, those barn signs always made me smile. 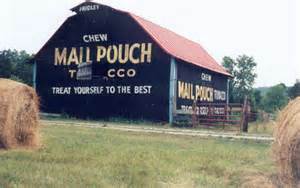 Turns out, there is a reason the Mail Pouch Tobacco barn signs were so numerous. Most were the prolific lifework of one man; Harley Warrick. 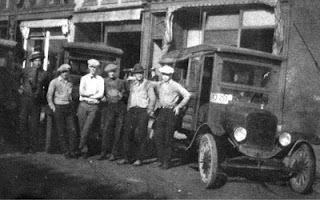 While the Mail Pouch Tobacco Company first began using barns to advertise their product in the 1890s, the practice took off in 1925 when the company sent out six men in two-man painting crews to “barnstorm” the countryside in Ford model T trucks. I always wondered what barn owners got in exchange for agreeing to have advertisements painted on their buildings. Turns out they were paid very little; $1.00 or $2.00 per year of advertising in the 1930s. The real value was not having to paint the barn themselves and they could pick whatever color they wanted the rest of the barn painted. A pretty good deal, I’d say. 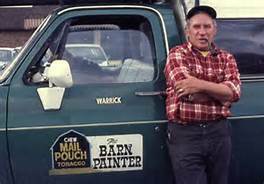 It was in 1946 when one of these painting crews came to the Ohio dairy farm of Harley Warrick, that kicked their barn advertising into overdrive. 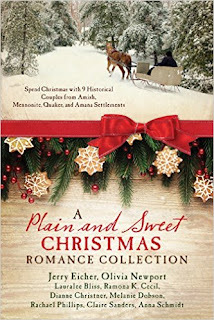 Twenty-one years old and fresh from WWII, Harley was living on his family’s dairy farm and employed at a sign shop when the Mail Pouch Tobacco painting crew asked to paint the family’s dairy barn. Harley expressed interest in joining the company and was hired as part of their two-man painting crews. For the next thirty-eight years, Harley Warrick traveled the country painting two or three barns a day, six days a week; an average of seven hundred barns per year. Another familiar barn sign you may have noticed while motoring across the county is the one inviting travelers to see Rock City, Tennessee; a ten-acre natural attraction near Chattanooga that features massive ancient rock formations, botanical gardens, and a seven-state panoramic view from Lookout Mountain. In 1936, Clark Byers had worked for a cotton mill and bottled buttermilk for $3.00 a week when a Chattanooga advertiser hired him to paint advertisements for the Rock City Gardens on barn roofs. 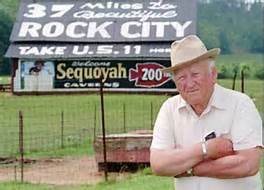 For more than thirty years Byers and two helpers painted slogans like “See Rock City, TN,” and “See 7 states from Lookout Mountain” on 900 barn roofs over 19 states. 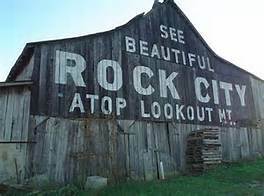 As compensation for the advertising, barn owners were given either promotional wares like bath mats and thermometers that bore the Rock City name, or $3.00 to $5.00 cash. Over his three decades of work, Byers braved slippery roofs, angry bulls, and lightning bolts to spread the word about Rock City Gardens. In 1968, while painting a roof near Murfreesboro, Tennessee, Byers made contact with a high voltage wire. The accident put him out of commission for months and convinced him to hang up his paint brush for good. 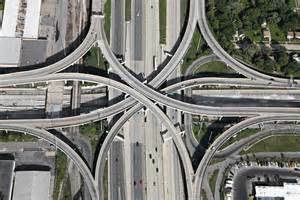 By the mid 1960s, the Highway Beautification Act of 1965 and the new interstate highway system dealt the barn advertising business a fatal one-two punch. The Act deemed the barn signs an eyesore while the interstate highway system lured travelers away from the roads and highways along which, the barn signs could be seen. Though often rickety and with their messages weather-faded, a fair number of these bucolic billboard barns still dot the rural landscape of middle America. If you should come across one and can make out it’s message suggesting you try a tobacco product or visit an attraction, I hope you will smile, think of Harley Warrick and Clark Byers, and take a moment to appreciate their life’s work before it disappears forever. I've heard of this type of advertising, but I don't recall ever seeing any in person. This was interesting, thanks for sharing. Hi, Debbie! Glad you enjoyed the post. I've lived in southern Indiana all my life, so these barn ads are common place to me, but it's kind of sad to see them going away. I've seen several barns with the advertising on them by growing up in rural Illinois. Today several barns in our area are putting a small to medium quilt design on their barn. Thank you for sharing the history--very informative. 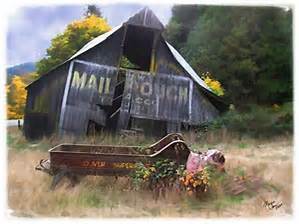 I remember seeing these barns when I was growing up. Thanks for the memory! You're so welcome, Louise! :-) There are still some around, but they are fast disappearing. Glad my post evoked a fond memory for you. This was great to learn about. I've seen painted advertising barns while traveling in the south, as a child, visiting my grandparent's farm. I think they are cool and comparable to today's metropolitan billboards; smart inexpensive marketing if you ask me. Would love for it to come back in fashion. Thanks for sharing. Hi, Marlene! I think your assessment is right on. I'd love to see them come back in fashion, too, but with all the new computerized billboards, I'm afraid barn ads are quickly becoming part of the past. What great information and photos! Thank you. I grew up on a farm in the country and remember barns being ads! What a fun bygone era. I love seeing them still - even though they are falling down. Me too, Susan. They are fewer and farther between, but they're still out there. Thanks for the post, Ramona. I've seen some of these while traveling through the country as a child. Too bad they won't be around much longer. Hi, Marilyn! I took them for granted most of my life, but now it makes me a bit sad to see how few there are still around. The only billboard barns I've seen up here are the ones showing the Farm Name. Thanks for posting this. Oh, yes. 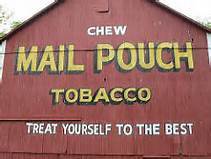 I also live in Indiana and see these barn advertisements all the time, mainly for Mail Pouch Tobacco. I've also seen a few barns that have it written into their sloping rooves with discoloured shingles. I always wondered about them lol. Thanks for the interesting article!